New book, 96 pages, COM90. In the 1970s the USMC bought the AV-8A Harrier from the UK to test V/STOL concepts for close air support. A successful funding battle was subsequently fought in the 1980s to secure military, political and economic support to expand this concept to develop and field the second generation AV-8B Harrier II from the late 1980s onward. The AV-8B was, and still is, the only tactical aircraft that could deploy with Marine forces on amphibious assault ships and provide air cover and close air support separate from large deck aircraft carriers. When Iraq invaded Kuwait in August 1990, a coalition of nations launched Operation Desert Shield in order to defend Saudi Arabia. The Harrier II was among the first tactical air assets to be deployed to the region to support ground forces in their efforts to halt the advance of Iraqi forces at the border with Kuwait and Saudi Arabia. During Operation Desert Storm, the five units flying the AV-8B in-theatre became some of the top tactical squadrons of choice by air mission planners for allied battlefield preparation and close air support. This was due to the AV-8B's capabilities, proximity to the battle zone and the proven abilities of Marine pilots and forward air controllers, who were closely integrated with ground forces and knew their business so well. The untold story of the AV-8B in this conflict is vividly brought to life by the author through firsthand accounts and period photography sourced from those that were there, as well as official archives. 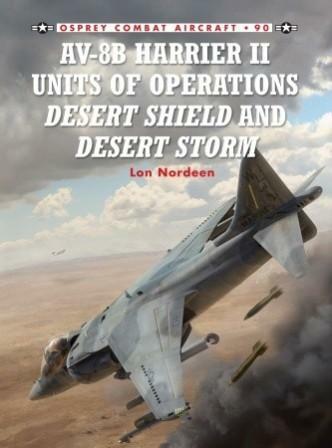 This is planned to be the first of three volumes on USMC Harrier IIs in combat, with follow-on titles covering the jet's operations in Iraq in 2003-08 and Afghanistan in 2001-2009.